We are no longer satisfied with just stimulating collagen scaffolding in the skin with laser or derma roller skin stimulation. As we age we run out of skin cells and our big goal is to stimulate the body to make more of these. 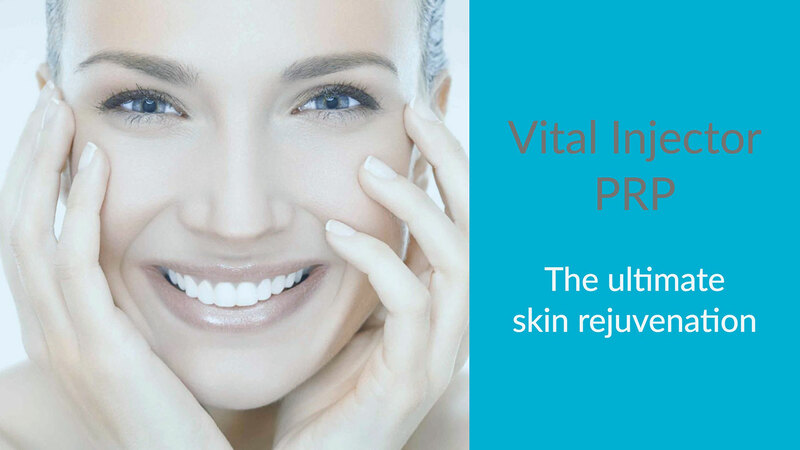 Until recently this was impossible to do, but PRP is 1 of 3 new modalities that has been shown to make new skin cells and injecting it with the new Vital Injector is one of our most exciting new innovations. The Vital Injector involves a series of injections to the whole face using a multiple-needle cartridge, and depending on the type of injectable substance used, has effective and long-lasting benefits in combating the signs of ageing. Typically used in combination with filler-type ingredients, we can now combine this amazing new procedure with Platelet Rich Plasma (PRP). PRP is the science of taking blood from your arm, spinning it down and putting only the concentrated growth factors back into the skin. This encourages the stimulation of brand new fibroblast cells in the skin, meaning more healthy collagen production and amazing anti-ageing benefits. Usually we use either the Dermapen or Fraxel laser to deliver these PRP growth factors into the deeper layers of the skin, but now we can make use of the Vital Injector. The question is how is the Vital Injector different to, or better than the other methods of PRP delivery? With all 3 methods, Dermapen, Fraxel laser and the Vital Injector, the depth of penetration of the PRP can be adjusted according to client tolerance as well as the area that you are treating, in other words one can adjust the depth of penetration around the eyes and other bony areas. However, the VOLUME of PRP that can be injected using the Dermapen or laser is minimal compared to the Vital Injector. With the Vital Injector, dosage can be adjusted to much higher volumes, meaning that more PRP is injected, resulting in even more stimulation of new fibroblast cells. As a result there is significant improvement in tissue regeneration and rejuvenation, increased collagen production, and a visual improvement in overall skin health and ageing. Whilst having the additional benefits of promoting skin metabolism and self-healing, the Vital Injector is relatively comfortable and pain-free, compared to the Dermapen and Fraxel lasers, where we often have to numb the skin before treatment.